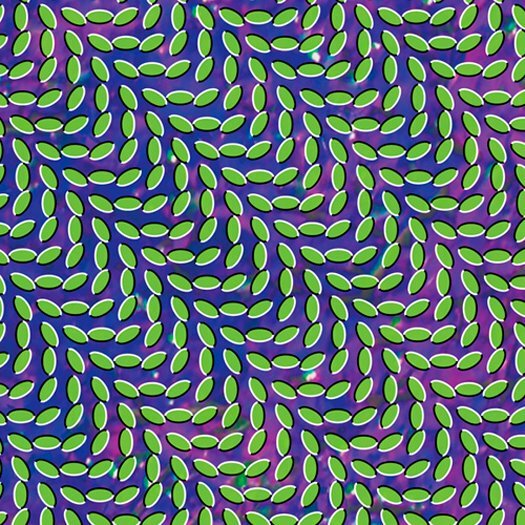 kidslooklikekats: Animal Collective: "Merriweather Post Pavilion". Whether you're one to argue Creationism or a Big Bang, you'll undoubtedly agree that the majesty and order now inherent in our universe was created out of an infinitely complex and mind-numbingly beautiful chaos, keeping in step with "ordo ab chao" and tickling the intellects of generation after generation of philosophers and deep thinkers. In much the same way, Animal Collective's Merriweather Post Pavilion is born out of one singular moment of disorder, dispelling amongst the ether the shattered fractals of an intelligent design yet to assemble. "In the Flowers" integrates spacey piano peckings with subtly-layered ambience, rising and exploding into an anthem of epic proportions; just as suddenly as it springs from the interstices between uncivilized music and ambience, it dissolves again into space. In many ways, "In the Flowers" works for and against the rest of the album. "My Girls" lacks the spaciness of the aforementioned, and instead soon becomes a pounding disco-centric tune, soaked in the reverb AC has become known for employing. "Also Frightened" is AC circa Sung Tongs, with a synthy twist, and showcases Avey and Panda's masterful vocal harmonizing (a la Wilson brothers) - though you'd almost swear Jean Michel Jarre's Oxygene suite lies buried, reinterpreted, somewhere within. "Summertime Clothes" and "Daily Routine" share a similar spirit, though couldn't be more sonically diverse, most notably in percussive temperment and melodic expression; the former creates a rigid and unstoppable force through a thumping beat and industrial synth pad, filling every crack and crevice with sun-drenched vocals, while the latter features a much more tribal percussive feel, and one which halts as tinkering keys bleed and coalesce with meandering vocals. "Bluish" is uncanny in its ability to separate the album into halves which do not necessarily belong together at once - just as multiple universes coexist, yet never overlap - and a large part of this separation is at once recognizable as AC's influences appear like shadows over the music, flashes of the Beach Boys' pop brilliance bursting and disseminating amidst the hazey instrumentation. Panda saves the somewhat mundane "Guys Eyes" with flashy drumming, and "Taste" stands firm as the most introspective and philosophical track of the bunch. The last three tunes of this otherworldly release really carry well the weight of an already creatively heavy work, with the experimentally-pleasing head-boppers "Lion in a Coma" and "Brothersport", as well as a more reserved classic-rocker in "No More Runnin'". Overall, Merriweather Post Pavilion is the promise of a bright and sunshiney 2009, though the obnoxiousness of such a promise is escaped narrowly, deftly, with the Collective's intuitive use of the atmosphere surrounding the music - just as important as the warping of space around celestial bodies. Without the pliable (though invisible) stuff between the notes, what have we but one more dry, characterless production stunt? The mastery is gauged in the manipulation of the negative space around the music, in order to create bold and boisterous new worlds - and ones we won't want to leave for some time to come.